Today is Halloween. For some it has it’s roots in Pagan festivals such as the Gaelic Samhain, the Welsh Calan Gaeaf or the Cornish Allentide. For others it is a festival of purely Christian origin. Either way, it’s definitely about death. At the end of October everything around you seems to be dying. The leaves are falling from the trees, plants wither away, even the sun is not looking too good. It’s really not surprising that, gathered around a fire, surrounded by flickering shadows and contemplating the long winter ahead, the thoughts of our ancestors turned a bit morbid. The transition between the very end of harvest and the darker half of the year was seen as a liminal time, which means ‘on the threshold’. Celtic people believed whatever separated our world from the world of gods, powerful spirits and the dead became less distinct. For Gaelic people this meant that the aos sí, the fairy folk, could easily pass into our world. So you had to be pretty careful. Gaelic fairies are not at all like the ones you meet in children’s fairy stories. They are volatile and capricious. If you left offerings of food and drink outside their dwellings at Samhain, they might allow your livestock to survive the winter. The aos sí lived underground, beneath great mounds of earth. When the mounds were excavated in later times by archaeologists, they were found to be ancient burial mounds. So likely the aos sí are a folk memory of ancient, long dead ancestors. This explains why people also believed Samhain was a time when their dead relatives might be able to return to them. This doesn’t seem to be something they were afraid of. Candles would be left burning to guide the dead back home. 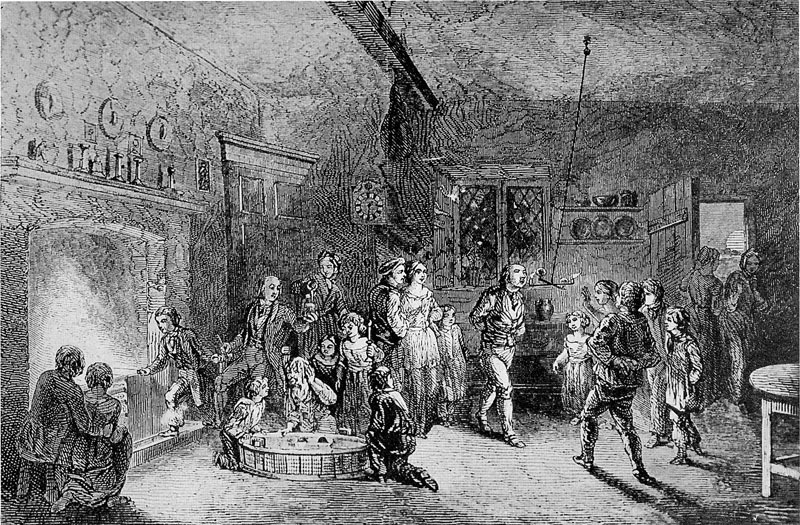 From at least the sixteenth century, the celebrations often included people dressing up and going form house to house asking for small gifts in return for a verse or a song. 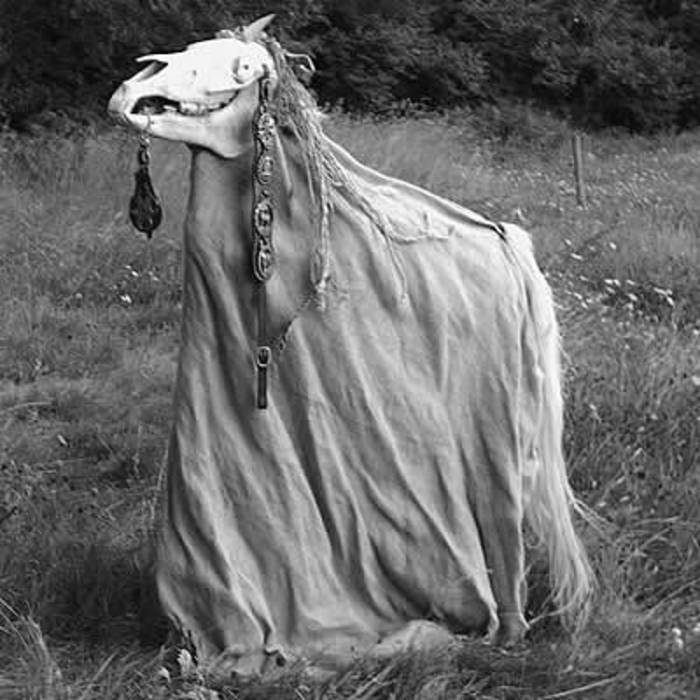 In some areas of Ireland and Wales, they also brought along the decorated skull of a horse. In the early 1850s, a man named William Hackett of the Kilkenny Archaeological Society describes a parade of youths, blowing cow horns and led by a man dressed in a white sheet topped with a horses head. The poem they recited, he said, was obviously pagan and contained two names that would not be tolerated, had they been uttered elsewhere. Mysteriously, he goes on to say that archaeologists will know which names he means. I, however, do not know. The homes visited by such processions could expect good fortune as a reward for their gifts or terrible disasters if they refused to comply. Perhaps originally the visitors represented the fairies or the souls of the dead and were accepting gifts on their behalf. It’s easy to see how the tradition of trick or treating might have come about. The Halloween lanterns, which were carved from turnips and carried on the procession, may have represented the souls of the dead. But perhaps they were just added to make the whole ordeal seem more frightening. As well as honouring the dead, people also believed that the blurring of the world of fairies and magic with our own gave them powers of divination. 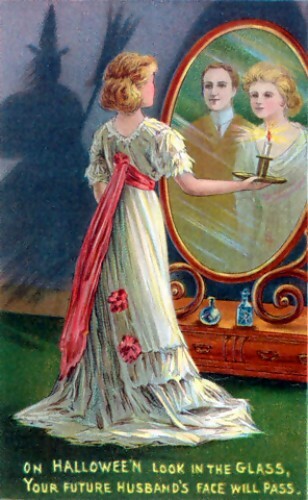 There are many games and customs associated with Halloween which are about predicting who a person will marry, or who will die in the following year. Roasting nuts over a fire was supposed to indicate whether your lover would be faithful or not. If the nut cracks or jumps, that is not a good sign. Apples were often used in divining your future spouse. If you could cut off the peel in one single length and throw it over your shoulder, the way it landed would reveal the first letter of your future partner’s name. Or if you ate an apple while gazing into a mirror, their face would appear behind your shoulder. If you saw a skull however, it meant that you would die before you married. Most of these seem to have been games played by young women, but the Scottish poet Robert Burns tells us about one played by men. Three luggies (dishes) would be placed on the hearth. One contained clean water, one dirty water and the third was empty. Each man would be blindfolded and asked to dip his fingers in one of the bowls, which had been shuffled about to prevent cheating. If he chose the bowl of clean water, he would marry a maid, the dirty water meant he would marry a widow and the empty bowl, that he would die a bachelor. Speaking as a widow myself, I don’t much care for being likened to a bowl of dirty water, but luckily, we live in more enlightened times. Death was very much on the minds of people celebrating Calan Gaeaf in Wales. There, everyone would write their names on stones and place them around a bonfire. When the fire died down, everyone would run home because there was an evil spirit about. This spirit took the form of a tailless black sow and a headless woman who would devour their souls, which is pretty disquieting. In the morning, they would go back and look at the stones. If anyone’s was missing, it meant that they would die in the following year. Apples feature very heavily in the Cornish Halloween festival of Allentide, named for Saint Allen, about whom we know nothing. The most important part of the celebration was the giving of shiny red apples to family and friends as tokens of good luck. There was a time when no child would sleep happily on Halloween night without an Allen Apple tucked safely beneath their pillow. Apples are a pretty big feature of Halloween in general. Bobbing for apples is well known, but we came across a more dangerous version associated with Allentide. A cross would be made from two pieces of wood and four candles would be placed on each arm of the cross. 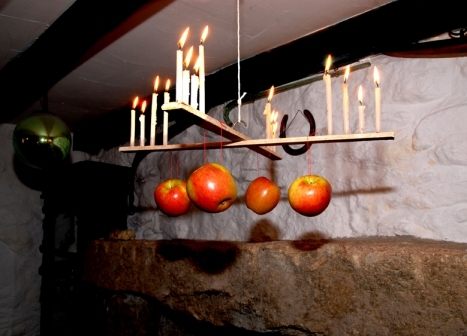 It would be hung from the ceiling with apples dangling on strings underneath. The purpose was the same, to get a bite of the apple, but if you weren’t quick enough, the hot wax from the candles would drip in your face. Some of the older Christian beliefs connected with Halloween are no less disturbing. All Hallows Eve was a day to pray for the souls of the recently departed. You might find groups of men dressed in black walking the streets and ringing a mournful sounding bell to remind us all about it. People believed that the souls of people who had died during the year could not get to heaven until All Saints Day on November 1st. So if any of the dead had any grievance with you, Halloween was their last chance to get at you. So it was best to go about in disguise on that day. 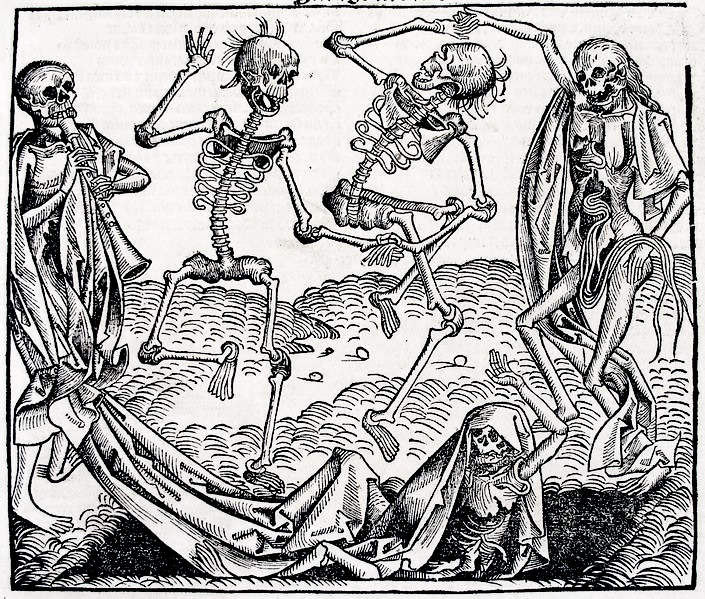 It was also possible that all the dead could rise up from their graves on that night, for a wild and hideous carnival known as the Danse Macabre. The image features in many medieval church decorations and reminds us that whoever we are, death awaits us all.